Image: Back row from left to right: Peter Lilley, Alex Palmer-Walsh, Ashleigh Clayton, Robin Jackson and Adrian Braine.Middle row from left to right: Joel Stobart, Mike Oaten and Robert Mocatta. Front row from left to right: Liz Humphries, Nadia Gorton, Andrew Gorton, John Morton, Sue Windley and Thomas Oakley. 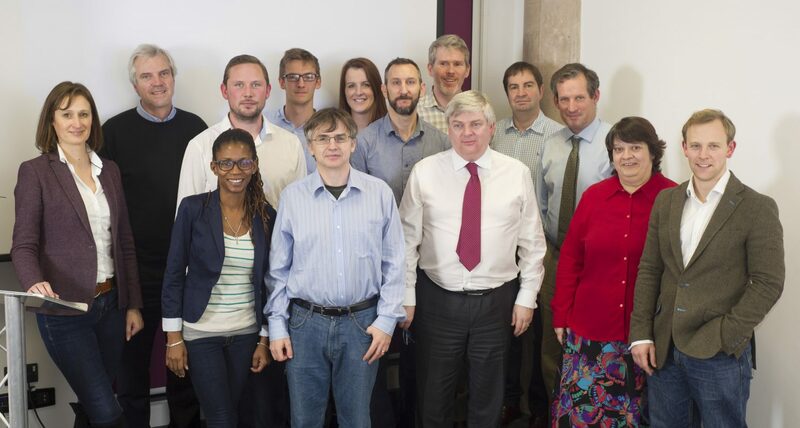 SETsquared, the world’s number one university business incubator, ran its three day entrepreneurship programme for the first time in Exeter this week, culminating in a prize-giving ceremony on Wednesday (2 December). The programme, which began on Monday November 30 and took place at the newly-opened Exeter Science Park, combined sessions led by experienced entrepreneurs and investors with lectures and small group workshops to equip delegates with contacts and the confidence to optimise their success. The comprehensive modules ranged from market analysis to the anatomy of a business plan and funding strategies. Following three days of intense training, eight companies pitched their business ideas to a panel of investors and received real-time feedback on their plans. A prize for the best pitch went to Joel Stobart with his business Custodian Solutions, who won a bottle of Champagne as well as the valuable experience of delivering in a real investor situation.